Broken Steeple: Molly kissing Wes under the weeping cherry tree. 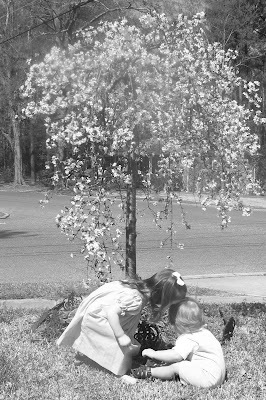 Molly kissing Wes under the weeping cherry tree. Groovy takes his first steps! God in Six Acts or "bible study at Ben's"
My friend Matt! It's been awhile since I touched base with you. How's everything? Your kids' pics look great. Still working on that school stuff - or are you finished? I'm in final stages of proposal preparation. I anticipate running my project through the summer and a December graduation - if all holds. My oldest son's wedding around New Year's and my wife's major surgery (8 weeks recovery!) kind of zapped me for while. But, March has been good for progress and I'm awaiting Dr. G's suggestions for sharpening chapter 3. Then, we're on!